Located near Golconda Fort is a necropolis of various rulers of the Qutb Shahi dynasty. Forming a large cluster, these tombs are known for their architectural design and are often frequented by photographers. Amidst a gobbled up green area for the sake of a growing concrete jungle lie the tranquil tombs of seven successive generations of the Qutb Shahi dynasty that ruled Hyderabad for about 170 years. These tombs are often said to form a golden triangle with the glorious Golconda Fort and the ever so beautiful Taramati Baradari in the same proximity. 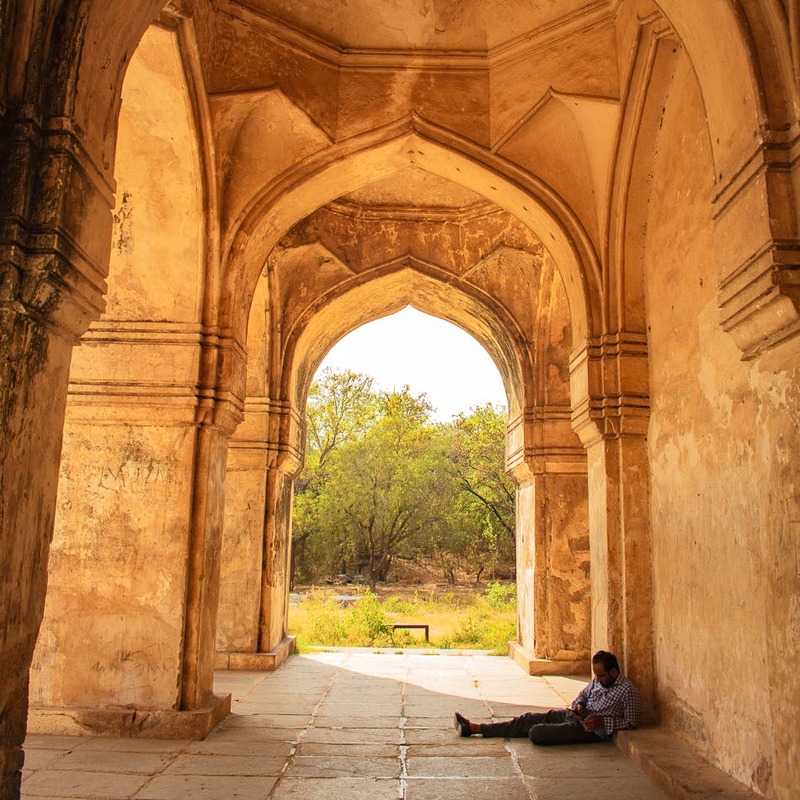 We visited these seven tombs one early morning and were mesmerised by the larger than life structures, the sprawling lawns as well as the multicultural spirit of Hyderabad. Although the tombs look alike from a distance with spectacular domes, they are all unique in their intricate design and finer details. Persian, Hindu, and Pashtun styles of architecture will consume you and you will feel like you’ve been teleported to another era. There is an unexplainable calmness that lingers as you walk through these tombs, and striking natural light seeping through the vents of the tombs for all the photographers who want grand shots. Since the area is surrounded by family homes, a lot of people do come here for a picnic and just to have a good time. Such is the beauty of this place that it makes people forget that they are actually in a graveyard (although a royal one). There are also two mosques and a small temple on the premises and people often come here to pray as well. At sunset, the Qutb Shahi Tombs are another kind of marvel, especially as their contour make attractive views. So, if you’re interested in witnessing the sunset, the best time to visit would be on late afternoons until dusk. The other good news is that the mausoleum has recently had 50 layers of whitewash to bring out the details from the 16th century.